With the dumbing of TV lately (think reality TV), I've caught myself following some of the Food Network's cooking shows when I needed a short diversion. None are as impressive as Rachel Ray's. What I love about watching her show is that it's all about freedom. You can be sure that no dish is ever prepared the same way twice. It's always full of terms like, "About a handful" and "You could use that instead." Each recipe I looked up would be one way in a cookbook, another on the Internet and a third way on the TV recipe site. After watching a few of her shows I found myself much more creative in the kitchen. 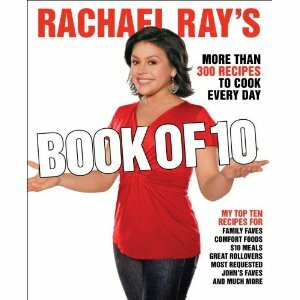 Given my fascination with her show, it was no surprise that I had to pick up a copy of one of her cookbooks - Rachel Ray's Book of 10. In this large, easy-to-read book has more than 300 recipes that include her top 10 - Family Faves, Comfort Foods, $10 Meals, Great Rollovers, Most Requested, John's Faves (her husband), Pasta, Vegetarian and more. It pretty much just sat on my shelf for the first couple of months until my daughter returned from Australian and acquired a new beau she wanted to cook for. She had a previous cookbook of mine that originally took centre stage, but this one knocked her socks off. Based on her feedback, I decided it was time to take a walk through its wide range of choices and try a few recipes. Most were fairly easy to pull together and none disappointed - although a few need some adjusting to match my family's taste. But if you have ever watched one of her shows you realize that's the beauty of what she is trying to teach. She encourages you to substitute ingredients with things you have in your cupboards (or just like better) and to adjust a recipe to make it your own. Here are just a few either Danielle or I tried with success and one I think works as a concept, but I need to experiment to find the right mix for me. The best part? If it says four servings they are usually very generous. I have always hated to try a recipe and find out the hard way that their four servings barely served three. One recipe alone from this book easily provided seven servings. This was one of Danielle's hits that I haven't had a chance to try yet. 2 10 oz. boxes frozen chopped spinach, defrosted. Wring out the spinach completely dry. Separate the spinach as you add it to a mixing bowl. Add the feta, chicken, onions, 2/3 of the chopped garlic, the grill seasoning and a liberal drizzle of olive oil to the bowl. Mix the meat with the veggies and feta and form 18 1-1/2" meatballs. Place the meatballs on a rimmed non-sick baking sheet and bake them for 10 to 12 minutes until they are golden and the juices run clear. While the meatballs back, place the yogurt, remaining chopped garlic, the cucumbers, dill cumin, coriander, lemon juice and a little salt in a food processor and process until until smooth. Adjust seasonings and transfer the sauce to a serving bowl. Serve the meatballs with a bowl of the sauce and toothpicks for dipping. I made the minty sauce; but tasted it and hated it; so I did not even offer it to anyone else. So you can leave the sauce part out. The chicken and couscous is delicious without it. In a sauce pot over medium-low heat, combine 2 cups of the chicken stock with the chutney and salt (if using) and pepper, bring to a bubble, and then turn down the heat to low to keep warm. Heat a large skillet, add oil. Once the oil is hot add the coriander, cumin and red pepper flakes and "toast" the spices, stirring constantly for about 15 seconds. Add the chicken and toss it in the spices until well coated. Spread the chicken out in an even layer and season with salt (if using) and pepper. Cook for about 2 minutes and then add the onions, red bell pepper, garlic and three fourths of the grated ginger. Cook for about 3 minutes, stirring frequently. Add the remaining 1/2 cup of chicken stock and continue to cook until almost all of the liquids have evaporated, about 2 or 3 minutes. Scoot the chicken and veggies to the sides of the skillet, creating a crater in the center of the pan. Add the chicken stock-chutney mixture and the lemon zest and juice, bring up to a bubble and then add the couscous to the crater. Give the skillet a shake to get the couscous to settle into the liquids but still try to keep it in the crater. Use the back of a spoon to spread it out into the liquids if the shaking doesn't do the trick. Cover it with a tight fitting lid or with a piece of aluminum foil (I put foil on first and then the lid) to hold in the steam. Turn off the heat and let it sit for about 5 minutes, to cook the couscous. To serve, mix the couscous with the chicken and veggies and spoon into bowls. If you are making the minty, cilantro sauce drizzle over the chicken and couscous. In a blender combine the yogurt, mint, cilantro, scallions, lime juice, the remaining grated ginger, and a small splash of water. Turn the blender on and puree until the mixture is smooth. Add more water if necessary. Season the sauce with a little salt & pepper. Drizzle over chicken and couscous. Easy, easy, easy. Although very mild in taste, everyone liked it (a real plus in my house). It really is more of a stove top pasta dish than the more traditional baked tuna casserole and I did a little substitution "a la Ray" style. For the white wine I used some chicken broth I had laying around that needed using up and I used sun dried tomatoes in oil, slightly drained. Last but not least is a recipe I loved the idea of, but felt it needed a few small changes to suit my family. It's called - Spinach-Artichoke Ravioli-Lasagna. In general I really loved the mix of white sauce, ravioli, spinach and artichokes. It had great flavour, but I found it a bit too heavy for my taste. That said, it would make a great party buffet dish as it was so filling you only needed a small piece. I would use less ravioli and more filling to start with. The idea of experimenting with different varieties of large stuffed ravioli with other types of sauces (traditional meat/tomato or maybe a cream pesto? ), cheeses and filling combinations is intriguing. Because I consider this a starting point recipe rather than a final product I am just including the link - http://www.foodnetwork.com/recipes/rachael-ray/spinach-artichoke-ravioli-lasagna-recipe/index.html. I would use this recipe as a launching point to create something uniquely your own. What's next on my list to try in this cookbook? It's called Smokey Chipotle-Chicken Corn Chowder with Salsa Salad! It sounds like a perfect warm meal to serve on a cold winder night. If you want to pick up a copy, here is a link to order online from Chapters, but I would suspect you could find it in any bookstore - http://www.chapters.indigo.ca/books/Rachael-Rays-Book-More-Than-Rachael-Ray-John-Cusimano/9780307383204-item.html?ikwid=book+of+10&ikwsec=Home.